The American Chamber of Commerce is delighted to announce the launch of the 2018 AmCham – DHL Express Success & Innovation Awards, held in conjunction with United Airlines. 2018 is the nineteenth year these awards have been held and they celebrate business achievement between New Zealand and the United States. "The annual Success & Innovation Awards provide an opportunity to showcase those companies that have demonstrated imagination, innovation and entrepreneurship, as well as honour and celebrate their achievements," said Mike Hearn, Executive Director, American Chamber of Commerce in New Zealand. A Supreme Award winner is selected from winners of each of these awards. AmCham also presents an award to the Member/Supporter of the Year. The winners of the importer, exporter, bilateral connections and tourism awards receive a return Economy Plus airfare to anywhere in the USA from United Airlines. Companies interested in entering the 2018 awards can find further information at www.amcham.co.nz or by contacting Mike Hearn – email mike@amcham.co.nz or phone 09 309 9140. Entries close at 5.00 pm on 31 May. Finalists will be announced on 5 July and the winners announced at a black tie awards gala dinner at the Pullman Hotel Auckland on 16 August. Previous winners of the Supreme Award have included ZESPRI International, Peace Software, Airways Corporation, HumanWare, Tenon, Zeacom, Specialist Marine Interiors, Fonterra and Christchurch Engine Centre, Buckley Systems, Vista Entertainment, Greenshell New Zealand, Orion Systems International, Fisher & Paykel Healthcare and Douglas Pharmaceuticals. 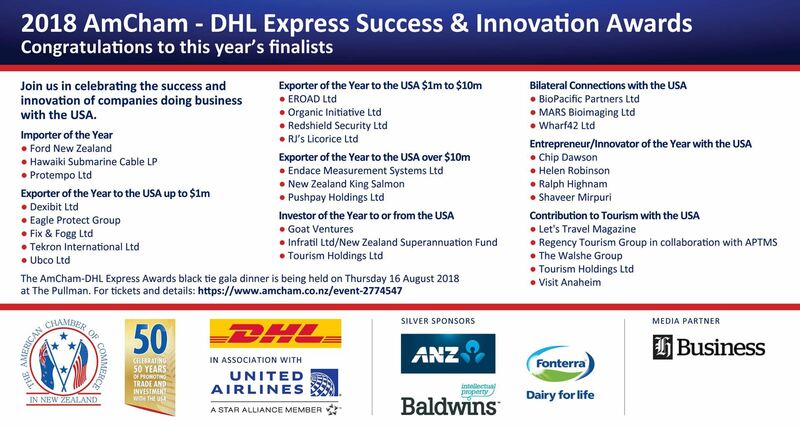 In addition to AmCham, DHL Express and United Airlines, the awards are supported by: ANZ Bank, Baldwins, Fonterra Co-operative, and the Business Herald.